Rain clouds continued to welcome us each morning. 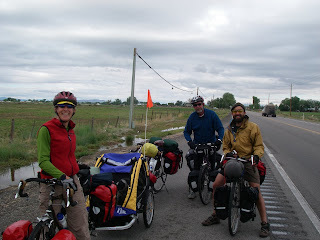 On the way out of Fallon, John from San Francisco caught us and we continued to pass each other's paths the whole day. We made good time across the salt flats east of Fallon with 25 miles in 2 hours before the first climb. We had watched the rain moving away from us until then, but our luck had run out. As a light shower started we put on all the rain gear. The higher we climbed up Salt Springs Pass the harder the rain came down and at the top we were drenched. The long descent brought us to large valley with another salt flat entirely covered in water. We were wet and cold and decided to press on to Middlegate to spend the night. 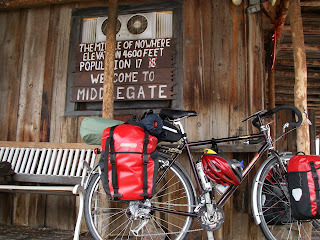 Middlegate is part saloon, restaurant, motel, store, gas station and local hangout. When we inquired about the cost of a room for the night, one of the locals sensing our cold and wet condition said it was $ 1,000 per night and the rest of the locals all chuckled. After putting only $ 35 down on the bar, we had a room and changed out of our wet clothes. We had several discussions about our trip with locals and other people passing through Middlegate. One local said we better be prepared for snow and we could see he was right when the sun came out and clouds cleared. 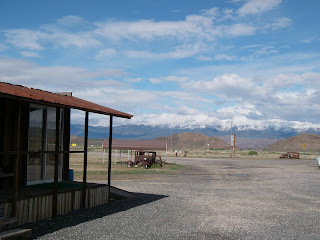 The Shoshone Mountains ahead were covered with snow. Diana - you should locate all the wineries along the route so that Steve would have the proper motivation. Great photo of the mountains! Diana, this blogging thing is really fun for us also. We feel connected with everyone and think it would seem like we were on a lonely odyessy by ourselves. Michael, thanks for the comment on the photo. This weather has made for alot of dramatic vistas. By the way, we've seen wineries in every county we've been in until Fallon, NV.